Check out this image from “BuzzFeed.” It’s so true! It’s a stressful time in college admissions season — the time when folks who applied Regular Decision are waiting on pins and needles. There’s a post on “BuzzFeed” by Marcelle Friedman and Jane Kelly entitled “21 Tips For Surviving College Admissions Season.” In the post, they write “try your best to stay calm.” Easier said than done for most college applicants, right? They also say to “resist the urge to discuss hypothetical outcomes that are now out of your hands.” Good advice. Again, easier said than done. “Ignore oversharers.” Seriously — don’t surround yourself with people who are going nuts about the college admissions process. Try to find some calm peers to stay sane. “Manage expectations and keep an open mind.” Good advice for sure. “Avoid buying presumptuous college swag.” Definitely don’t walk around in a Harvard sweatshirt if you haven’t heard back from the school yet. That’s just bad karma all around! “Reevaluate who you follow on Twitter.” Definitely don’t follow people who Tweet about how they got into the school of your dreams. That’ll only trigger jealousy. You don’t need that! We like how the writers especially pointed out people who write about receiving Likely Letters. So true. Don’t post your Likely Letters on the Internet, people. You’ll only regret this decision later! “Keep in mind that one man’s safety school is another man’s pipe dream.” Be careful about which schools you refer to as safety schools because while Michigan may be your safety school, there are tons of people who would do quite a lot for the chance to be a Wolverine. 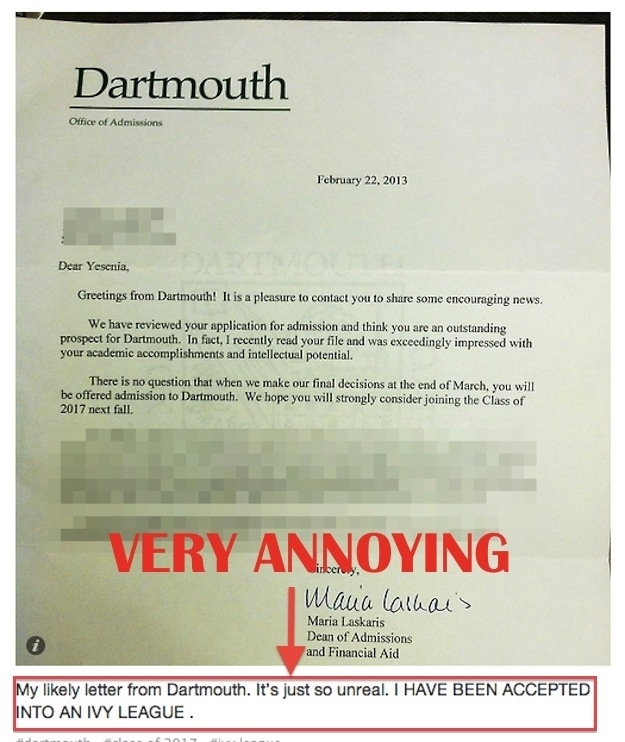 “Do not ask someone else to open your envelope or admissions email.” It should be you who reads this news. You should be alone. Don’t be surrounded by friends. That’s a big mistake many high school seniors make each year. Anyhow, check out the article for more great advice on surviving the stress of college admissions season. The writers are spot on!